Bowne & Co. Stationers (NYC); South Street Seaport Museum. Monday's Child. Chekhov, Anton (With an introduction by John Gielgud). Two Plays of Anton Chekhov: The Cherry Orchard; Three Sisters (from "The 100 Greatest Books Ever Written" series). (SMITH, Joseph). Bibliotheca Smithiana, seu Catalogus Librorum D. Josephi Smithii Angli per Cognoma Authorum dispositus. We can help you find the presses & publishers books you are looking for. As the world's largest independent marketplace for new, used and rare books, you always get the best in service and value when you buy from Biblio.com.au, and all of your purchases are backed by our return guarantee. Capel-y-Ffin, Abergavenny: Francis Walterson [Printed by the Chiswick Press], 1927. Limited Edition. Hardcover. Near fine. Gill, Eric. No. 24 of 150 copies, octavo size, 23 pp., signed by Eric Gill. Saint John of the Cross (1542-1591) had a crucial influence on the Catholic Church and the Counter-Reformation, in response to the Protestant Reformation; a Carmelite friar and Spanish mystic, he was arrested and imprisoned for his reform work. In his prison cell in Toledo, he composed most of what became his best-known work, "The Song of the Soul" or the "Spiritual Canticle". This edition of the poem contains wood engravings by Eric Gill (1882-1940), an English sculptor and printmaker deeply influenced by his Catholicism and who illustrated many books for fine presses such as The Golden Cockerel Press. Gill mingles the sombre forms of religion with the sensuality of his figures, revealing a deeply embedded spirituality that complements the poetry. ___DESCRIPTION: Quarter red buckram with green and blue mottled batik boards, gilt lettering on the spine, all edges uncut, title page with a wood engraving by Eric Gill, four wood engravings (including title page) by Eric Gill: "The Flight" (P493), "No Wild Beast Shall Dismay Me" (P494), "Our Bed Is All of Flowers" (P495), and "The Soul and the Bridegroom" (P496); Batchelor handmade paper, octavo (8.5" x 7"), pagination: -21  [1 colophon], one of 150 copies, this number 24, signed by Eric Gill on the colophon. ___CONDITION: Volume is near fine, with clean boards, straight corners, a strong, square text block with solid hinges, the interior is clean and bright, all illustrations are beautiful, bright, and clean, and entirely free of prior owner markings; boards have some sunning to the top edges, the spine is slightly sunned, slight rubbing to the corners, and there is some off-setting to the free endpapers. ___CITATION: Gill no. 280. ___POSTAGE: International customers, please note that additional postage may apply as the standard shipping charge does not always cover costs; please inquire for details. ___Swan's Fine Books is pleased to be a member of the ABAA, ILAB, and IOBA and we stand behind book we sell. Please contact us with any questions you may have, we are here to help. Broadway: J. Rogers [for the Middle Hill Press], 185- Single small sheet printed on one side on blue-grey paper. No need to go to a Church "to hear false doctrine". Holzenberg 440. Disbound. Very Good. London: The Folio Society, 2007. three volume set,original cloth backed decorated boards hardcover,llustrated,708 pages,fine in fine original slipcase.. New Edition. Hardcover. Fine/No Jacket. 8vo - over 7¾" - 9¾" tall. Franklin Center, PA: Franklin Library. Fine. 1983. Hardcover. Bound in full genuine leather with gold trim, gilded page edges, four raised bands on the spine, moire endpapers, and a sewn-in bookmark. Part of Franklin's The Collected Stories of the World's Greatest Writers series. Limited Edition. Illustrated with 18th Century engravings. Portrait of Cervates by Istvan Ventilla. Translated from the Spanish by Samuel Putnam. Volume contains "Prologue", "Rinconete and Cortadillo", "Man of Glass", "The Colloquy of Dogs", and Notes. This volume is unread. No bookplate. No previous ownership marks of any kind. I bought this book from an original Franklin subscriber who put it on his bookshelf in the early 1980s and didn't take it down until he sold it to me. Ships same or next business day in a box. .
Easthampton MA: Cheloniidae Press, 2014. Hardcover. Fine. Hardcover. Number 15 of 150 copies. Signed and numbered by the book artist Alan James Robinson. This wildflower alphabet book is the first book issued by Alan's highly regarded Cheloniidae Press in several years, and the first produced using the Giclee printing process, which he calls a "new direction" in our ever changing world. It is intended to be the first in a series of Natural History Abecedary Editions. There is also a Fine Art edition of Wildflowers with twenty-eight original watercolors. The illustrations for this Giclee edition are printed from the artwork created for the Fine Art watercolor edition. The illustrations in this edition show the lovely renditions of a flower, often accompanied by a butterfly or other insect, for each letter of the alphabet. Each page is headed by a calligraphic letter in red, designed originally by Master Calligrapher Suzanne Moore for the press's A Fowl Alphabet in 1986. This accordion style book is bound in pale yellow cloth with the title in gilt to the front cover. It is housed in a green cloth slipcase with the title in gilt to the spine. In fine condition. 8.5 x 5 inches. Unpaginated. PRI/071817. Norwalk, Connecticut: The Heritage Press. Fine. 1961. Hardcover. Fine blue marbled boards with blue spine title. Includes The Heritage Club Sandglass book review pamphlet. In Very Good Plus blue slipcase--sun tanned at edges. Preface by J. Donald Adams. Ships same or next business day. ; 8vo 8" - 9" tall . Franklin Center, PA: The Franklin Library. Near Fine. 1980. First Edition; First Printing. Hardcover. 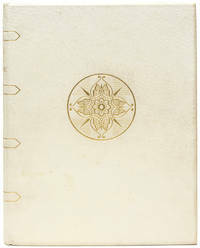 A Limited First Edition. Begins page 3: "His deck chair was a bale of hay. The horses he was taking to New Zealand wouldn't need it before the trip was over. It was grass hay..." Includes an eight page "Notes from the Editor" in like new condition. Ships same or next business day. Book is lightly worn along tail edge of pages and tali edges of front and back covers. Bound in genuine leather with gold gilt, three raised ribs on spine, gold gilt page edges, silk moiré endpapers, silk page marker. ; 8vo 8" - 9" tall; 363 pages . Chicago: Printing Office of Philip Reed, [ca. 1954]. Holiday Greeting Card on a Folded Sheet. 4.5" x 6.25", [4 pp.]. Very Good. Letterpress on Deckled Wove, Red Inked Engraving. Mr. Reed was known for an innovative technique that created multicolored prints from wood engravings, a technique similar to color separation in offset printing. New York: Limited Editions Club, 1969. Hardcover. Fine in glassine and a Fine slipcase with very slight darkening to the backstrip. Agnes Miller Parker. Octavo (6-1/2" x 9-1/2") bound in quarter green morocco and green boards; 452 pages. Designed by John Dreyfus and printed at the Spiral Press. With an introduction by John Bayley and wood engravings by Agnes Miller Parker. Copy #457 of 1500 SIGNED by the illustrator on the colophon page and with the additional loose SIGNED engraving enclosed in a paper sleeve not found in all copies. Monthly Letter laid in. London: The Folio Society. VG : in very good condition with maroon slipcase. Slipcase scuffed and faded. 1978. First FS Edition. Buff hardback cloth cover with red/gilt design. 250mm x 160mm (10" x 6"). 249pp. .
City Lights, 1964. First printing with $1.50 cover price. A collection of 'spontaneous stanzas published in the order and with the natural sounds in which they were first written.' Very good minus with cover rubbing, soil and edgewear. 106 pp.. First Edition. Soft Cover. Very Good. Book. Waltham Saint Lawrence: Golden Cockerel Press, 1928. Hardcover. Quarter yellow buckram and hand-marbled boards. Fine. Gibbings, Robert. 57 pages. 22.5 x 15.5. Illustrated with engraving on wood by Robert Gibbings. Limited edition, copy 14 of 600 on English hand-made paper in 12 pt. Caslon Old Face. Another example of Gibbing's work when he owned the press. Bright copy, deckle edges. Bookplate of Richard D. Frtedlander. CHANTICLEER. 57. Demeter Press , 1995. Hardback. 29pp. Frontispiece. Unnumbered proof limited edition of only 110 copies. Two other copies available.. Limited. Hard Cover. Near Fine. New York: Random House/The Modern Library. As New in As New dust jacket N.D.. Reprint. Hardcover. 8vo 8" - 9" tall; 423 pages . New York: Limited Editions Club, 1948. Hardcover. Rubbing to the spine tips, as often the case, but with just a touch of the usual darkening to the vellum spine. Near Fine in Very Good sunned slipcase with minor splits. Uncommon with the spine not darkened. Douglas Gorsline. Beautifully designed and illustrated small folio (9" x 13") bound with a white vellum spine stamped in gilt and decorated boards. With instructions on "How to Angle for a Trout or Grayling in a Clear Stream" by Charles Cotton and with an introduction by James Russell Lowell. Illustrated with several ORIGINAL FULL-PAGE ETCHINGS and photogravures by Douglas Gorsline. Copy #916 of 1500 numbered copies SIGNED by the artist on the colophon page. London: Chiswick Press - Longmans & Co, 1900 [ii], 50 pages. In the original paper covered boards with cloth spine. Browned and soiled. Front free end paper browned. Loosely inserted small sheet with printed list of three Lectures by Morris reprinted in the Golden Type. This list is very spotted. Colophon - Reprinted at the Chiswick Press with the Golden type designed by William Morris for the Kelmscott Press and finished on the twentieth day of December 1900.. Hard Cover. Good. New York: Boni and Liveright, 1919. Reprint Edition . Leather Bound. Very Good/No Jacket. 12mo - over 6¾" - 7¾" tall. MODERN LIBRARY # 3. The Modern Library of the World's Best Books Very good green limp croft leather. Gilt titles and decoration. Slight wear, soiling. No jacket. Toledano Spine # 2. Brodzky B Endpapers. (n.d., Circa 1919), 12mo, 250pp. 6 page advertising catalogue bound in. CONTENTS; The incarnation of Krishna Mulvaney -- The three musketeers --The courting of Dinah Shadd --On Greenbow Hill --The taking of Lungtungpen --The daughter of the Regiment --The madness of Private Ortheris -- The god from the machine --Private Learoyd's story --The solid Muldoon --With the main guard --Black Jack --The big drunk draf' --L'envoi. London: The Folio Society. G : in good condition without dust jacket. 1965. First FS Edition. Dark green cloth spine grey marbled paper boards. 300mm x 220mm (12" x 9"). 61pp. .
Cambridge, Massachusetts, U.S.A.: Zoland Books, 1993. Advance proofs in plain wrapper. Unread, fine with pub's "Uncorrected Proof" stamp to front matter and some advance reviews laid in. Cornish served as appointed Boston Poet Laureate from 2008.to 2013. 108 pp.. First Edition. Soft Cover. Fine/No Jacket. Book. New York: Limited Editions Club, 1967. Hardcover. Spine evenly sunned. Near Fine, lacking the slipcase. Charles Mozley. Tall octavo (7-1/2" x 11-1/2") bound in full maroon buckram, with spine stamped in burgundy and lettered in gilt, top edge stained red; 212 pages. Designed by Sir Francis Meynell. Introduction by Bernard Bergonzi. Illustrated with full-page black-and-white line drawings and 12 full-page color lithograph plates by Charles Mozley. Copy #473 of 1500 copies SIGNED by the artist on the colophon page.